First make sure that you have Samsung Pay on your Galaxy S8. As cool as this app is, there are many options to this technology, and your carrier may have preferred to not have it preloaded. 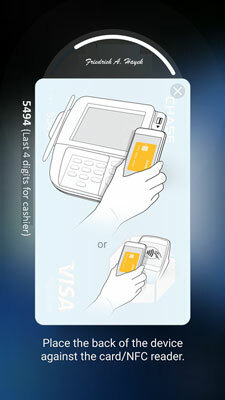 The Samsung Pay logo is seen here. The Samsung Pay and the Android Pay logos. It is easy to confuse Samsung Pay and Android Pay. These are two different applications. Android Pay is nice, but it does not have the Magnetic Secure Transmission capability that allows you to use mobile payments at many more retailers. 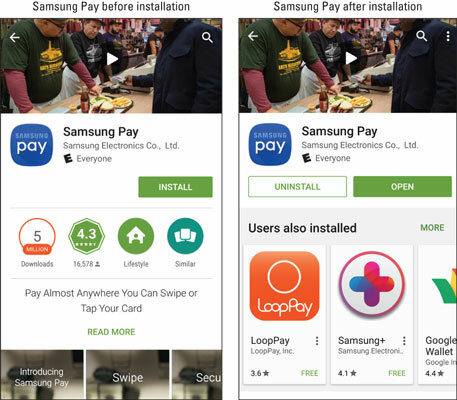 The Samsung Pay app Play Store images before and after installation. The Samsung Pay app works a little different than most other apps. The first time you open Samsung Pay, you will be given information on how to use it and be asked to put in your credit card information (in a very convenient way, by the way) and asked all kinds of permissions and agreements. Once you have given all this information, Samsung Pay waits patiently at the bottom of your home pages, ready to meet your payment needs with nothing more than a quick swipe from the bottom of the screen. Most people would simply not use this app if they had to go digging through their screens to find the app. This way, you do not have to search to find the app and wait for it to come up. The figure shows the Lock screen with the Samsung Pay launch button sitting at the bottom ready to appear with a quick flick. The Samsung Pay quick launch button. The launch button is also there on the Home screen, but is not visible when running other applications.